ST. GEORGE, Katharine Price Collier, a Representative from New York; born Katharine Delano Price Collier, July 12, 1894, in Bridgnorth, England; at the age of two came to United States with her parents, who had been living abroad, and resided in Tuxedo, Orange County, N.Y.; attended private schools; at the age of eleven returned to Europe and was educated in England, France, and Germany; returned to Tuxedo, N.Y., in 1914; member of the town board of Tuxedo Park 1926-1949; member, treasurer, vice chair, and chair of the Orange County Republican committee, 1942-1948; delegate to the Republican National Convention, 1944; member of the Tuxedo Park Board of Education, 1926-1946, serving as president, 1930-1946; elected as a Republican to the Eightieth and to the eight succeeding Congresses (January 3, 1947-January 3, 1965); unsuccessful candidate for reelection to the Eighty-ninth Congress in 1964; chair, Tuxedo town committee; died on May 2, 1983, in Tuxedo Park, N.Y.; interment in St. Marys-in-Tuxedo Church Cemetery. 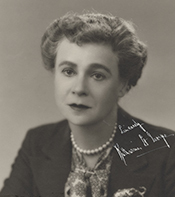 Katharine St. George in Women in Congress, 1917-2006. Prepared under the direction of the Committee on House Administration by the Office of History & Preservation, U. S. House of Representatives. Washington: Government Printing Office, 2006.